Everyone wants to trust their local Denver locksmith, but what do you need to do first? You should make it a habit when you move into a new neighborhood to take the time and get to know the service providers you may need in an emergency. Know the people who can be trusted and relied on when needed. These are the lifesavers you may need to call when you are having difficulties; your list of trusted individuals should include key services, such as household appliance repairs, A/C repairs, electrical repairs, a locksmith, a doctor, the nearest hospital, your local post office branch, a trusted veterinary office, and so on. A list should be created and kept somewhere you can easily access it. Include the name of the company, contact name, phone number, and specialty. Once you’ve chosen providers for each category, meet and introduce yourself and get business references to check for service reliability and trust. You do not want to get caught just calling the first name and number in the phone directory in an emergency. You need to know who you are sharing vital information with and that their reputation is for service and reliability. For example, a locksmith will have access to your home or car; make sure they are licensed and experienced. If you are using local services in your neighborhood, stop by their office and check out their facilities. Ask for references from other customers and check those out. You do not want service personnel in your residence that you have not checked out and have no referral of service. You also need to know their reputation for trustworthiness, on-time scheduling, experience and training, reliability, and price competitiveness. Trusting your locksmith is the same as knowing your local butcher. Can you trust that the keys handed you to your residence are the only keys in existence? With a reputable locksmith, you have built-in acceptance of their skill and confidence. Moving into a new home or apartment is about as safe as moving into a facility with no locks. Do you know if the locks to your residence were changed prior to you moving in? Do you know that you have the only keys to the home or unit? Who holds backup keys to the facility and what are their hours of business? If you can’t answer these questions, you’ll want to have your locks rekeyed first thing. If you need a locksmith in an emergency, check whether they are certified and bonded for an added level of safety. Know who you are calling to protect yourself from future problems. When you move into a neighborhood, it is a good idea to check with your local locksmith and see if you should change the locks or have the locks rekeyed. If there is there more than one key to the residence, ask if it’s possible for all of the locks to be rekeyed for a single key. Sometimes this is a good idea when you have children or elderly family members living with you. One-key doors will assist all family members in the home by helping them the right key for the door at all times since only one key would be required. Another thing you may not have thought about is a new lock that is a key/code entrance. With a keyless entry system, the key to unlocking the door is a touch code for final unlatching, not a physical key. 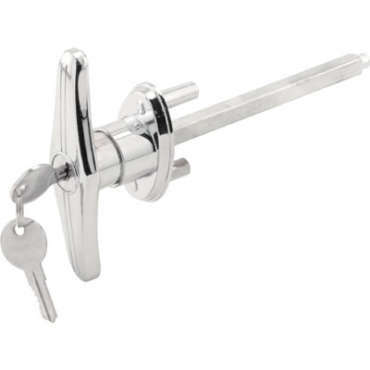 This would serve as a double lock instead of two deadbolts. Keyless entry systems also serve as a safety measure against a lost key. If you need to restrict access, simply change the code on the door — no rekeying necessary! While you are discussing locks with your local locksmith, be sure to consider any interior locks you may need to have changed or installed in your residence. Are there things you need to keep safe inside your home or office? Maybe this includes valuables or documents you need to keep safe under lock and key? You need to have a locksmith you can trust. Many professional locksmiths can help with safe installation and maintenance as well as household locks. Comfort is another issue worth discussing when it comes to locks, and that means talking about doorknobs and door handles. As many people now have their elderly relatives living with them, it’s important to consider the doorknobs throughout the residence, including the front and back doors. Are these knobs easy for the aging people to manage, and would a door handle be easier for them to use? One of the ailments people acquire as they age is arthritis, and round doorknobs are often a difficult item for the elderly (and for young children) to manage. So, many people are switching to door handles just for the ease of use. Review with your locksmith window locks, especially if your windows are at a street level or have easy access from fire escapes. You may want to change the existing locks to these gated windows, or other locking systems already installed. Be sure to protect your life and your property. Get to know the trustworthy service providers in your neighborhood. It is your responsibility to protect yourself from intruders and unwanted guests in your residence. You have a right to know your service providers trustworthiness and skills. For help in Denver and across the Front Range, connect with Job Done Locksmith to learn more about how we can help secure your home!